The Associated Press points out this is the graphic that Petraeus won't show on the hill tomorrow. There is NO trend line down, only a trend line UP. Why won't Petraeus tell the truth? Email this story to your congressperson and senator. UPDATE: Check out this graphic from McClatchy DC Desk. 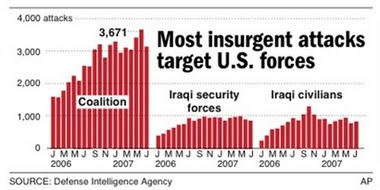 At the bottom they show how the Pentagon is cherry picking the statistics it wants to fake trend lines.